In the early days of sewing the tapestry a few embroiderers gathered with Charles to demonstrate the stitches for a photo call for a Dalesman magazine. One of the less experienced in the group sewed his shirt to the tapestry! 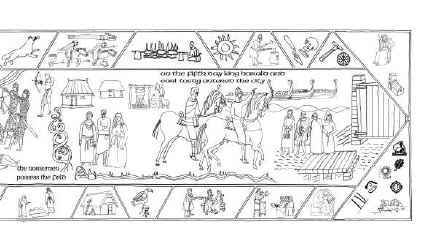 Dorrie's tale: The embroidery of the Battle of Fulford Tapestry began in an 'open space' in Barley Hall. tables had to be put up and the tapestry, stretched over a framework, was placed in the best position to catch any sunlight fighting its way through the horn windows. One of our first actions on entering the Hall was to turn down the volume of the music emanating from the CD player. No doubt the staff downstairs thought the volume was fine. To us working next to it, it was infuriatingly loud and depressingly mournful in tone. We were asked to start embroidering from the centre of the tapestry and to work outwards. This was fine for those of us with long arms but was a real problem for the embroiders who were 'vertically challenged'. Later on we were allocated a room downstairs and we were able to recommence our stitching in peace and quiet. When we had been upstairs, the general public had shown great interest in the tapestry. This had meant that we had spent a lot of time explaining to people what we were doing and not so much time actually doing it! Much later, we were told that the room was needed for educational purposes. We had to pack our trunk and leave. Fortunately The Dig was able to offer us a space and we took up residence there. Roman helmets, breastplates, bones and cloaks mingled with primary school children eating their packed lunches. Light streamed through the huge arched window and, as long as the table had been dusted, it was an excellent place in which to stitch the tapestry. But it was cold in winter! All good things come to an end and we were told that the space was needed for educational purposes. (Where had we heard that before!) We were on the move again. A day was spent searching the city for a suitable place in which to continue our embroidery. The Merchant Adventurers Hall welcomed us with open arms. With the use of the kitchen whenever we felt the need for a restorative cuppa, we have been able to complete the tapestry in very congenial surroundings. Dorrie is front left in blue. My experience when working on the Battle of Fulford Tapestry. 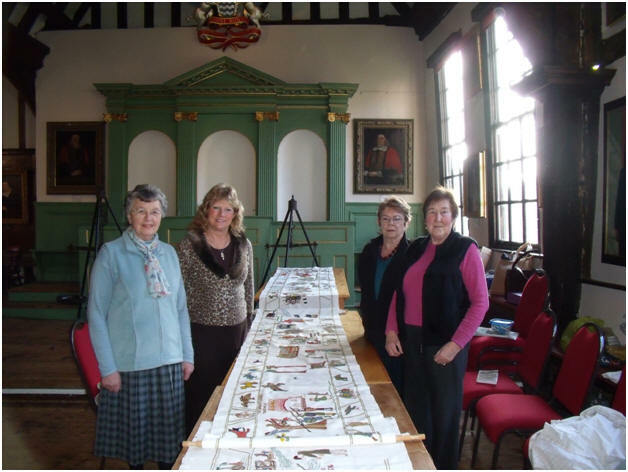 (Sheila rear right) I joined the Tapestry group about three years ago to work with the very pleasant ladies (above) in the relaxed atmosphere of the Barley Hall. This wasn’t to last as we were asked to find another place to work as the room was required by school parties. The Dig, part of York Archaeological Trust, was suggested, and we moved our wooden trunk into an upper room in this Archaeological Centre. This was a noisy place as school parties were attending when we were working and again we were asked to move. Jill and I made a list of all the likely places in which we could work: The Quilt Museum, they wanted payment; The Viking Museum- there was no room; The Yorkshire Museum- deputy curator would ask the curator who was presently on holiday; the main Library- could offer a room on Saturday or Sunday –not suitable as we work on Wednesdays; The Castle Museum and The Priory Centre, they wanted payment. Frustrated we went for lunch in a Pub and enquired about a room- not suitable too dark. The next venue was The Merchant Adventurers Hall, who were delighted to have us work in their mediaeval hall, so this is where we stayed until we finally finished the Battle of Fulford Tapestry. 1 When I first began to sew the tapestry there were only three others involved. (Dorrie, Jill and Maria) The first panel had been worked on for three years at that time and still had very little done. I decided to have a recruitment campaign. The next ‘residents weekend’ at the end of January when all the visitor attractions are free for people who live in York seemed the ideal opportunity. I printed flyers inviting embroiderers to join us and that weekend we encouraged anyone interested to do some trial stitches on spare material. From this we got several new members. The Press gave us coverage with a colour photo and more embroiderers came forward from that too. 2 Some of the wool just shredded away when sewn, we discovered it was the carpet yarns that did this, not being designed for repeated pulling through the linen cloth. 3 The first dying provided colours that were never again to be produced. It was a shame as the beautiful dark wine red was quickly used up. Also the lack of black and other dark colours became a problem as we found edging each image in a dark colour made it stand out better. 4 There was a major problem with the amount of linen material needed. Whoever began the tapestry did not think about how they placed the first images on the material. The result of this was that the spare material was on the left of the first panel instead of the right. The meant the first panel had to be cut away from the rest of the material and joined to the other panels. What should have only had one join, had two and there was not enough material to complete the work. Another large piece had to be bought and I spent a long time deciding where the join was to be. The design is dense and did not allow for a break, in the end I decided to put it right through an image so, hopefully, the join would be obscured by a group of figures. 5 Whilst the tapestry was at Barley Hall it was on a frame which was covered with a cloth an left on a table when we weren’t actually working on it. There were school parties coming round and at some point a heavy object was placed on the tapestry or somebody trod on it causing tears to the fabric. 6 One summer (2009 I think) the tapestry had no home. The box was taken to Sheila’s house and she and Jen worked on one piece through the summer. Another piece was taken by Jill and Dorrie and I had the third. I worked all the green parallel lines so they were straight and in the same colour on the newest piece of linen. I thought this was essential because the first panel’s lines were very wavy as they had been worked when the tapestry was stretched on the frame by different people with different stitch tensions at different times. It looked a mess. A lot of these lines have been rest itched now. 7 The joining of the three pieces. It was essential they were joined absolutely straight. Diane pulled out single threads to make perfect lines. I sewed them together using a cotton thread in an over and over stitch as demonstrated to me by Isabel, one of the Norwegian ladies who visited us in the Spring for the Viking Festival. 8 Each York Viking Festival held in York in February a group of Vikings from Norway came to offer support and encouragement.